The Mio FUSE has all the features you want in a fitness tracker paired with the engineered precision of Mio Heart Rate Technology. Mio FUSE takes your performance and training to a whole new level. Not only can it monitor your heart rate with peak accuracy during workouts, but it also tracks your steps, calories, distance, pace, and goal progress throughout the day. Mio FUSE FREQUENTLY ASKED QUESTIONS How do I choose the right size? Mio FUSE is available in two sizes. Size Small/Medium fits wrists 5.8" - 7", Size Large fits wrists 6.1" - 8.2". Question not answered here? The Mio Support Team is happy to help you out; send us an email us any time at support@mioglobal.com, or call us at 1-877-770-1116 (Mon-Fri: 9am to 5pm PST). Do I need a smartphone to use FUSE? To configure and sync FUSE you'll need the Mio GO app, which is available for iOS and Android smartphones. FUSE is compatible with the following devices: IOS: iPhone 4S and higher, iPod Touch 5th gen. Android Devices: HTC One (OS v4.3+) & M8, LG G2 & G Pro2, Motorola Moto G, Moto X, Droid RAZR M, RAZR Maxx HD, Droid Ultra, Maxx, Mini (OS v4.4+), LG Nexus 4, 5, 7, Samsung Galaxy S3, S5, S5 Mini, S4, S4 Mini, Note 2, Note 3, Note 10.1, Sony Xperia Z, Z1, Z1 Compact, Ultra, ZR, ZL, Sony Xperia SP, V. FUSE cannot be synced to or be configured with a Windows phone, Blackberry device, desktop computer, or laptop. What should I do if I'm getting inaccurate heart rate readings? Inaccurate readings are usually caused by poor contact between the heart rate sensor and your skin. Make sure that FUSE has a snug fit on your forearm, about 2 finger widths above your wrist bone. If you have a very small wrist, wear FUSE higher on your forearm. You can also try wearing FUSE on the inside of your arm. What apps can I use with FUSE? You can only configure and sync data from FUSE with the Mio GO app, but you can transmit heart rate directly to any app that syncs with Bluetooth Smart (4.0) heart rate sensors. Some popular apps include: Strava, MapMyRun, RunKeeper, Endomondo, Wahoo Fitness, Pear Sports, and DigiFit. Connect FUSE as a heart rate sensor through the settings of the app you'd like to use. Can I transmit heart rate from FUSE to exercise equipment? FUSE transmits heart rate using Bluetooth Smart (4.0) and ANT+ heart rate profiles to equipment such as bike computers, GPS watches, treadmills, rowing machines, and more. To see if your device/equipment is compatible, look for a Bluetooth 4.0 or ANT+ logo, or view your product's Specifications section on the Mio Global website for a full list of brands and models. The Sony Core SmartBand along with the free Lifelog Android app that tracks your walking, running, cycling, travelling and even how you slept - discover just how much you live! 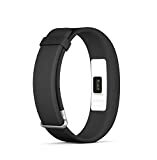 SmartBand 2 is an innovative life logging wristband that monitors your pulse, Heart Rate Variability (HRV), your movements and the quality of your sleep. SmartBand 2 is compatible with both Android and iOS devices. 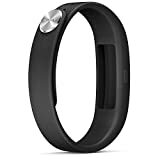 SmartBand 2 gathers information on your daily activities. The sensors on the device can help your gauge physical exertion when you exercise by monitoring your pulse and the changes in your heart rate. With the SmartBand 2 on your wrist, it can count your steps whether you're out for a stroll or jogging in the park. It also has a smart wakeup feature that wakes you up at the best time in the morning based on your sleep cycle. Once paired with a compatible Android or iOS device, SmartBand 2 uses 3 LEDs and vibrations to notify you when an alarm, a message or a call arrives. You can even use SmartBand 2 to control media playback or the camera on your mobile device. This device is not a medical device. It is not intended for medical use or to replace the advice of a qualified medical professional. Please seek medical advice before undertaking any new or altered training regime using this device, particularly if using this device together with a pacemaker or other medical devices. Le bracelet connecté Sony SmartBand Talk SWR30 deviendra le compagnon idéal pour suivre votre activité quotidienne, vous fixer des objectifs, passer et recevoir vos appels. Le SmartBand Talk est un bracelet innovant qui enregistre votre vie et garde une trace de chacune de vos activités, de vos déplacements à vos conversations, en passant par vos loisirs. Enregistrez les moments les plus précieux de votre vie, et revivez-les sur votre smartphone ou votre tablette Android (Android 4.4 ou ultérieure). Le SmartBand Talk est relié en permanence à votre smartphone via Bluetooth®. Le vibreur vous prévient dès que vous recevez un appel, un message ou une notification. Lorsque vous vous déplacez en musique, vous pouvez lire un morceau, le mettre en pause ou le passer à l'aide du bracelet SmartBand. La connexion s'effectue en toute simplicité avec la technologie NFC ou par le biais d'une procédure de connexion Bluetooth® classique. Même éloigné de votre smartphone, Smartband Talk enregistre des informations sur vos activités, puis les transfère automatiquement sur l'application Lifelog.